RGV FC Toros' Kai Greene (2) and Saint Louis FC's Lewis Hilton (8) battle for the ball in a United Soccer League game at H-E-B Park Friday, March 16, 2018, in Edinburg. EDINBURG — Unsure where RGV FC’s scoring punch might come from this year, first-year coach Gerson Echeverry spent much of the preseason focused on possession and defense. 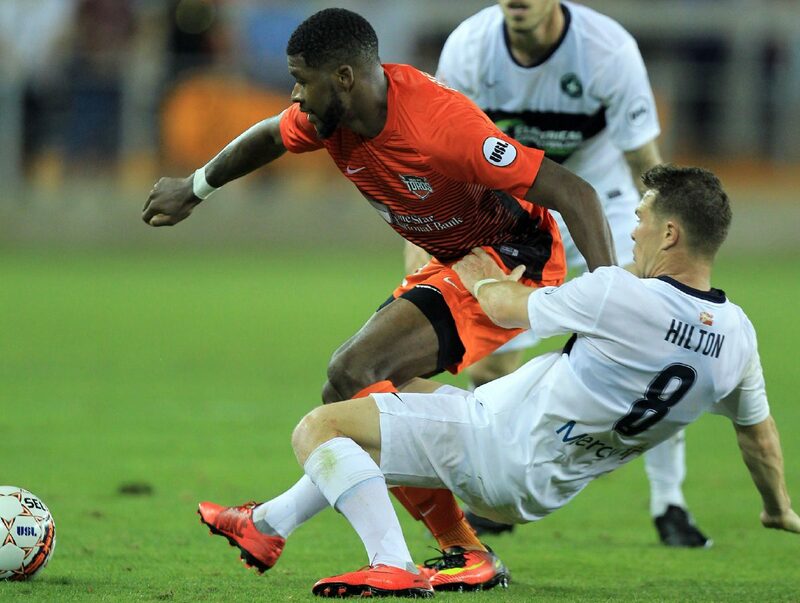 In RGV’s season opener against Saint Louis FC on Friday night at H-E-B Park, Echeverry came away pleased by the Toros’ attacking opportunities but disappointed in their possession. Combined with a late breakdown defending a corner kick, the result was a 1-1 draw. RGV started just two returners from last year’s roster — midfielder Todd Wharton and defender Kai Greene. Pablo Aguilar, one of many young first-time professionals on RGV FC’s roster, scored the opening goal for the Toros during the 77th minute. The scoring play started when Jhon Montano, a 72nd-minute substitution, dribbled around a defender on the right wing. Echeverry subbed Montano in knowing that Saint Louis’ defense might be starting to wear down, and the 18-year-old sent the ball past his marker’s left shoulder before sprinting around his right side to retrieve it. Montano triggered a rolling pass slightly behind Aguilar in the center of the penalty area, so Aguilar stopped the cross with his right foot, spun and kicked it into the lower-left corner of the net with his left. 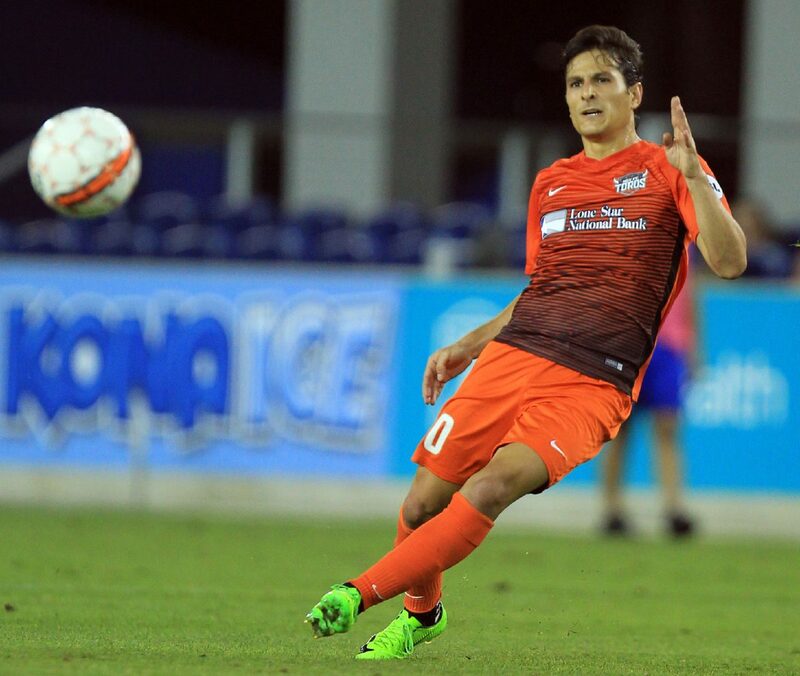 Aguilar was selected 59th overall in the 2018 MLS Superdraft by the Houston Dynamo after wrapping up his college career at the University of Virginia. Saint Louis swiftly answered, scoring off a corner kick in the 82nd minute. The set piece was sent into the 6-yard box, where Wal Fall connected with a header that rang off the RGV FC crossbar. The rebound bounced high into the air, and Tony Walls leapt and volleyed the ball into the net with his right foot from just a couple yards out. Echeverry said he identified defending set pieces as a weakness during the preseason, and the deficiency cost RGV FC on Friday. For the game, RGV attempted nine shots and put five on target, while Saint Louis had eight shots with two on target. Wharton was credited with three chances created and a shot on target, while Aguilar, Jesus Enriquez, Zach Wright and Guillermo Delgado each put a shot on net for RGV FC. RGV outshot Saint Louis 6-1 with the wind in the first half but was outshot 7-3 against the wind during the second period. Possession favored RGV FC, but only just slightly at 50.8 percent. Echeverry said possession will be the biggest focus for improvement going forward, while Donovan said the new, young team still had plenty to work on after a solid opener.